Treegator® Slow Release Watering Bags were designed with the green industry professional in mind. That's why Treegator® has been trusted by professionals worldwide since 1989. Treegator® is the perfect watering product for your busy schedule. Your work day is measured in hours, not weeks - Why wait up to two weeks or more for your tree watering system to do it's job? Treegator® uses a patented design to provide an effective watering that efficiently delivers deep water saturation in less than 12 hours. Just fill up a Treegator® Bag in the morning, and it will efficiently water your trees before the end of the day! And, since Treegator® provides deep water saturation with each application, you only have to fill it once a week for most new tree plantings! Treegator® is the perfect watering product for your busy schedule. Treegator® Slow Release Watering Bags make anyone a "watering professional". Treegator® uses a proven, field-tested design that makes tree watering so easy, anyone can use it. There are no nozzles or fittings to install, no pipes, no wood stakes, and no timers. The only tools you'll need are your own two hands. You've already worked hard enough planting your tree... Why spend even more time and energy digging trenches, hammering stakes, or fitting emitters together? Just wrap a Treegator® bag around your tree, zip it up, and fill with it water.Treegator® makes tree watering easy! Treegator® Bags are ready to move whenever you are. Treegator® is a portable irrigation system in a bag. Each bag weighs less than 2 lbs. when empty, and can be folded or rolled up for quick and easy transport or storage. 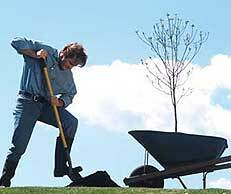 Treegator® allows you to efficiently water your trees, and then move on to the next job. Once the bags have emptied, simply unzip them and take them to another job, or store them until needed again. There are no stakes to hammer, no bulky tubs or buckets to carry, no small components to lose, and no extra pieces to buy. With Treegator®, you can move or store hundreds of bags with very little time, effort and space. Every Treegator® Slow Release Watering Bag is backed by a limited manufacturer warranty against any defects in materials or workmanship. Treegator® is made in the USA of high-quality UV protected plastic materials. Our Treegator® Original comes with a 5-Year limited warranty, and our Treegator® Jr. Pro comes with a 3-Year limited warranty from the date of purchase. Use Treegator® on your new trees for the first 1 to 2 growing seasons; then, use it as a supplemental watering device after establishment. Treegator® will last long enough to water your trees for years to come - guaranteed.